It appeared to be a classic mismatch on October 15, 1978 as the Dallas Cowboys, with a 4-2 record, faced the winless St. Louis Cardinals, who were 0-6 and, going back to the previous season, had lost a total of ten straight contests. Coached by Tom Landry for the 19th season, the Cowboys were the defending NFL Champions and, while off to a somewhat slow start, they remained formidable. 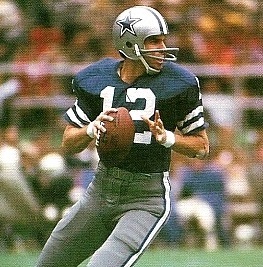 QB Roger Staubach (pictured above) directed an offense that could run the ball effectively with HB Tony Dorsett or strike from the air to wide receivers Drew Pearson and Tony Hill. The defense was strong, with the line anchored by DE Harvey Martin and DT Randy White and containing an excellent secondary. St. Louis had fallen on hard times after winning two division titles under Don Coryell in 1974 and ‘75. Coryell had departed following a 7-7 record in ’77 and Bud Wilkinson, a legendary college coach who had nevertheless been away from the sidelines for many years, was in his place. While the Cardinals had an able quarterback in Jim Hart and a good line, they lacked outside speed at running back. The club had yet to score more than 17 points in a game and the defense had difficulty against the run, giving up 216 yards on the ground in a loss at Dallas three weeks earlier. There were 48,991 fans in attendance at Busch Memorial Stadium. In the first quarter and following a fumble by Roger Staubach that was recovered by NT Mike Dawson, the Cardinals advanced 47 yards in seven plays. FB Jim Otis ran for the last two and a touchdown, followed by Jim Bakken’s extra point. Dallas missed an opportunity a few plays later when SS Charlie Waters nearly intercepted a Hart pass with a clear field in front of him, but dropped the ball. Later, however, and following a punt that had the Cowboys starting from their one yard line, the visitors drove 99 yards in 11 plays. Drew Pearson gained 28 yards on a reverse and Staubach completed passes to Tony Hill for 17 yards and TE Billy Joe DuPree for 20 along the way, and capped the series with a six-yard TD throw to FB Robert Newhouse. Rafael Septien tied the score at 7-7. The Cards put together their own long drive, covering 87 yards, and Otis again capped it with another touchdown, this time from a yard out. Bakken’s point after put the home team back in front by 14-7. In the last minute of the first half, CB Roger Wehrli intercepted a Staubach pass and Jim Hart connected with HB Steve Jones for a 38-yard gain, but he lost his grip on the ball just short of the goal line and, while WR Pat Tilley nearly recovered in the end zone, CB Aaron Kyle recovered instead for the Cowboys. The score remained unchanged at halftime. Still up by seven points in the third quarter and with a fourth down at their 37, the Cards were forced to punt. However, punter Steve Little dropped the snap and, while he recovered, was unable to run past the line of scrimmage. Dallas quickly capitalized on the next play, utilizing trickery. Tony Dorsett took a handoff, gave the ball to Drew Pearson coming around on an apparent reverse, and the wide receiver then flipped it back to Staubach, who threw long to Tony Hill in the corner of the end zone for a 37-yard touchdown. Septien added the game-tying extra point. Two minutes later, and following Harvey Martin’s sack of Hart that had Little punting from his own end zone, WR Butch Johnson returned the line-drive kick 23 yards to the St. Louis 15. Helped along by a pass interference penalty, the Cowboys scored when Staubach connected with Hill for another TD, this time from six yards out. Septien’s conversion had the Cowboys in front by 21-14 with 1:17 remaining in the third quarter. St. Louis came back with a nine-play, 68-yard series that stretched into the fourth quarter. Hart threw to WR Mel Gray for gains of 30 and 19 yards and finished the possession off with a one-yard toss to HB Wayne Morris for a touchdown. Bakken’s conversion knotted the score again at 21-21. Later in the period, the Cards drove from their 17 to the Dallas 16, but with 2:54 left in regulation, Bakken missed a 33-yard field goal attempt that struck the left upright, one of several instances in which both teams missed opportunities to win in regulation. As the clock counted down to less than a minute to play, the Cards lost Hart, who was sacked again by Martin and had to leave the game due to a shoulder injury. 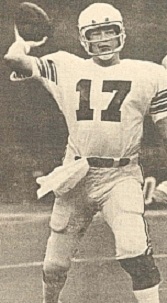 With rookie QB Steve Pisarkiewicz now behind center, the Cards punted shortly thereafter and another good return by Johnson gave Dallas excellent field position at the St. Louis 32. Staubach passed to Pearson for 15 yards and, with the ball at the St. Louis 16, it appeared that the Cowboys were on the verge of putting the game away. Newhouse fumbled on the next play, however, and LB Steve Neils recovered for St. Louis. Pisarkiewicz then threw long for Gray, but it was intercepted by FS Cliff Harris. Staubach connected with Pearson to pick up 25 yards and, once again, Dallas had a shot to win. But with the clock down to one second, Septien’s 49-yard field goal attempt was blocked by DE John Zook and, following an eventful final minute of regulation, the game headed into overtime. The Cowboys won the toss to start the extra period and, taking possession at their 23 after the kickoff, Staubach started off with two completions before he had to leave due to injury. It didn’t deter Dallas as Newhouse carried for 13 yards, Dorsett for six, and Septien kicked a 47-yard field goal at 3:28 into the extra period. The Cowboys came away with a hard-fought 24-21 victory. Dallas led in total yards (418 to 372) and first downs (24 to 21). The Cowboys also recorded three sacks, to one by St. Louis. However, the visitors turned the ball over four times, to three by the Cards, and amassed 12 penalties at a cost of 109 yards while St. Louis was flagged four times. Roger Staubach completed 23 of 40 passes for 289 yards and three touchdowns while giving up two interceptions. Drew Pearson had 7 catches for 101 yards and carried the ball twice for 34 yards while Tony Hill contributed three receptions for 60 yards and two TDs. Tony Dorsett was held to 24 yards on 12 carries and Robert Newhouse topped the Dallas runners with 47 yards on 12 attempts against a surprisingly stiff St. Louis defense. Butch Johnson averaged 15.8 yards on four punt returns. For the Cardinals, Jim Hart (pictured at right) was successful on 17 of 28 throws for 264 yards and a TD while being picked off once. Jim Otis gained 88 yards on 28 rushing attempts that included two touchdowns and Wayne Morris added 30 yards on 13 carries and had a TD among his four pass receptions for 26 yards. Mel Gray gained a team-leading 89 yards on his four catches. Roger Staubach missed no time with his injury, which was minor, and while it was initially projected that Jim Hart would be out for at least three weeks, he missed just one. The Cowboys won their next game, lost two, and didn’t lose again as they finished atop the NFC East with a 12-4 record. They again reached the Super Bowl before losing to Pittsburgh. The Cardinals fell to 0-8 before turning around and winning six of their last eight contests. St. Louis ended up with a 6-10 tally and placed fourth in the division.